LinkedIn is a powerful sales tool. To harness its potential, though, you need to use it effectively. That starts with creating a great profile. The better your LinkedIn profile, the more likely someone searching for your product or service is to find you. But what makes a great profile? And how can you build one with a minimum of fuss? Wouldn’t it be great if someone could take you by the hand and tell you exactly what to type in where? 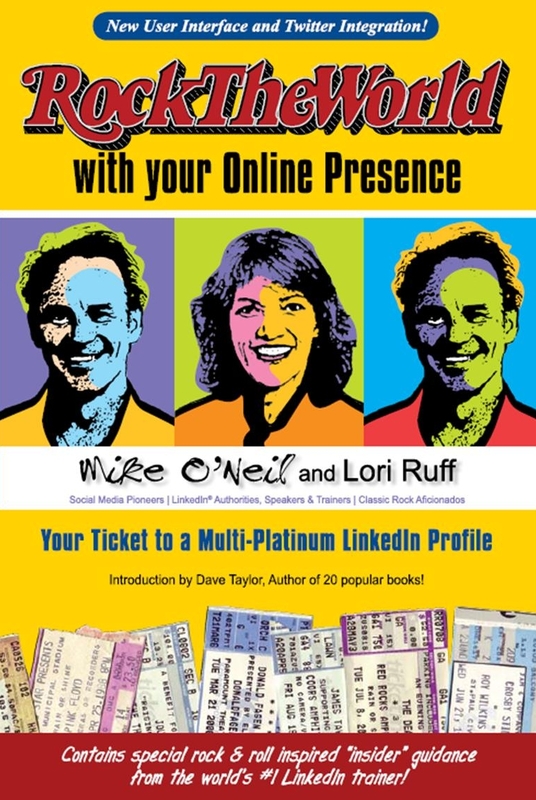 That’s just what Mike O’Neil and Lori Ruff have done in Rock the World with Your Online Presence: Your Ticket to a Multi-Platinum LinkedIn Profile (CreateSpace, $19.95). In this well-thought-out book, O’Neil and Ruff, two of the world’s top LinkedIn experts, take you step-by-step through the process of building a robust profile. The chapters and sub-chapters are laid out in the order each subject appears in a LinkedIn profile, starting with Name, Location and Industry, all the way through to Contact Settings and Opportunity Preferences. Not sure what to enter in a certain field? O’Neil and Ruff describe precisely what should go in there and provide examples. In each section, O’Neil and Ruff share important Do’s and Don’ts, as well as best practices culled from their research into thousands of profiles. Their goal is for you to create your profile strategically, to give you an edge over the millions of other people on the site. After you’ve built your profile (which, with the help of this book, shouldn’t take you very long) you’ll discover more about how to use LinkedIn. Additional chapters cover topics such as the LinkedIn Dashboard, Privacy Settings, Applications and Groups. The book is well written and easy to read, with rock & roll metaphors sprinkled liberally throughout. (Hence the title.) The authors refrain from using jargon and explain everything clearly enough for even technophobes to understand. There are also plenty of screen-capture shots to illustrate precisely what’s being discussed. Do the book’s strategies work? Is it worth investing twenty bucks and a few hours in front of your computer to create or upgrade your LinkedIn profile? Well, using O’Neil and Ruff’s approach, I rewrote my entire LinkedIn profile. Not long afterward, I learned that when a person searched for the key words I used, my profile came up first. Score! That’s the best endorsement of this book I can make. The Queen of Soul isn’t the only one who wants a little respect. Buyers want it too, and as a general rule, they’ll give their business to the company and the salesperson who gives it to them. People are busier today than ever before. So their time is at a greater premium than ever before. Don’t waste it. Give people credit for being smart. Don’t assume they know less than you do. (With the abundance of information available today on the web, buyers often know more than the salesperson does.) And don’t do anything to make them feel stupid. Don’t show your prospect what you like best, or the newest thing, or the option on which you get the biggest spiff. Show them what best meets the greatest number of their specific needs. One of the things buyers hate most is when salespeople try to push a product or service that’s more expensive than the prospect wanted to spend. If their budget is simply unrealistic, you may need to discuss their budget with them and help them reevaluate it, but do so in a respectful manner. We all value things like quality, service, capabilities, thrift, durability, speed, reliability, cleanliness, security, convenience, luxury, excitement, and variety differently. Just because your prospect doesn’t value one or more of these characteristics the same as you, doesn’t mean they’re wrong. Women are buyers. And if they don’t feel they’re being taken seriously, they’ll go somewhere else. Even if a couple is shopping and the woman is not the driver of the purchase, you can bet she’s an influencer—women control the checkbook in 80% of households. Whether a person is white or black, young or old, rich or poor, gay or straight, ambulatory or in a wheelchair, they are entitled to their dignity. This is non-negotiable. Every person on the planet is unique, with their own needs, desires, priorities, fears, challenges and experiences. Nobody wants to be treated as just a number. When you respect a prospect’s individuality, you start to build a relationship. Listen to my interview with Michele Price on Breakthrough Business Radio. First you’ll hear Michele dish out some important social media advice, then you’ll hear Mitchell From discuss tips and tactics for better referrals. After that, Michele and I talk sales insights and strategies for a full hour! Get ready to take notes! To listen to other interviews, click here. And be sure to check out Michele’s blog at www.WhoIsMichelePrice.com. People in my sales seminars tell me the biggest challenge they face when networking is not knowing what to say. So they often avoid meeting new people or avoid going to networking events at all, losing out on countless sales opportunities. Savvy networkers know that the key to effective conversations is to ask questions. Asking questions lets you accomplish three things at the same time. First, it gives you control of the conversation, relieving the other person of having to think of what to say next. As a result, you can direct the conversation and keep it moving. And third, questions communicate your interest in the other person, helping them feel appreciated and understood. (The secret to building instant rapport.) And it’s a fact of human nature that if you give people a chance to talk about themselves, they’ll think you’re a great conversationalist! 2. Do you have a specialty or an area of focus? 3. How do you do that? 4. How did you get into that field? 5. What changes have you seen in your industry? 7. What’s your biggest challenge? 8. What’s your latest success? 9. What are you hoping to achieve next? 10. Who’s your target market? 11. How did you hear about this event? 12. What made you come here tonight? 13. Have you been here before? 14. Are you a member of this organization? 15. Who else do you know here? 16. What do you read to keep up? 17. What’s the best book you’ve read lately? 18. Where are you from? 19. Where did you go to school? 20. What was your major? 21. How long have you been in the area? 22. What made you move out here? 23. What do you do for fun? 24. Are you a sports fan? 25. Did you see the game last night? 26. Do you have any kids? 27. Where else do you go to network? Memorize these questions, develop a few of your own and use them the next time you’re at a networking event. You’ll find the conversation flows easily and productively. Do you have a suggestion to add to this list? What are your favorite networking questions?